Nutrients in fertilisers can be food for devastating algal blooms in Roebuck Bay, so overuse on gardens and lawns in Broome isn’t on! When lawns and gardens are over fertilised the unused nutrients can reach the bay through leaching into the water table and into the bay, or, by washing into stormwater drains that flush into bay during rainfall events. 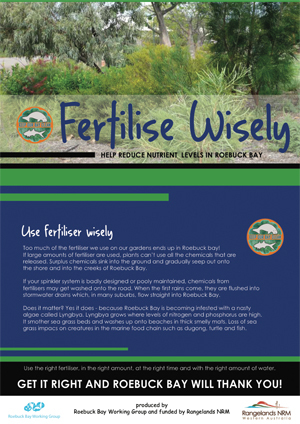 The Roebuck Bay Working Group has released a new brochure to create awareness of the serious impacts of algal blooms of Lyngbya and to offer tips for wise fertiliser use. By reducing known foods for Lyngbya blooms we can contribute to a healthy bay with abundant marine ecology.